The Nigerian Stock Exchange (NSE) should be worried: Ibeto Cement Company Ltd, a Nigerian cement producer, has executed a reverse merger, by acquiring a small U.S. petroleum company, Century Petroleum Corp. Simply, this company did not even bother listing on the NSE; it went for the big board and that is America. Watch out, other Nigerian companies will mimic Dr Cletus Ibeto, flooding U.S. with reverse mergers, if this works out. Who does not want U.S. dollars in the age of well-beaten Naira? On May 25, 2018, Dr. Cletus M. Ibeto was appointed as our new Chairman of the board of directors. of the board that will help me breath life into what Century Petroleum will ultimately become.ed Century Petroleum Corp and, having taken over the reins as the new Chairman The appointment of the new CEO in the person of Erroll A. Booker, who will also function as a member of the Board of Directors, is well thought-out and I have no doubts that he will contribute to the accomplishment of the strategic objective which underlies the acquisition of Century Petroleum. lbeto Cement Limited, located in Rivers State (Nigeria), began cement bagging operations at its bagging terminal in Port Harcourt in 2005. It acquired 70% of this U.S. company which is traded on OTC. It added: “By this reverse merger which is expected to be sealed and publicly presented in 90 days, Ibeto Cement will achieve the historic milestone of being the first Nigerian firm to be listed in the United States Stock Exchange. 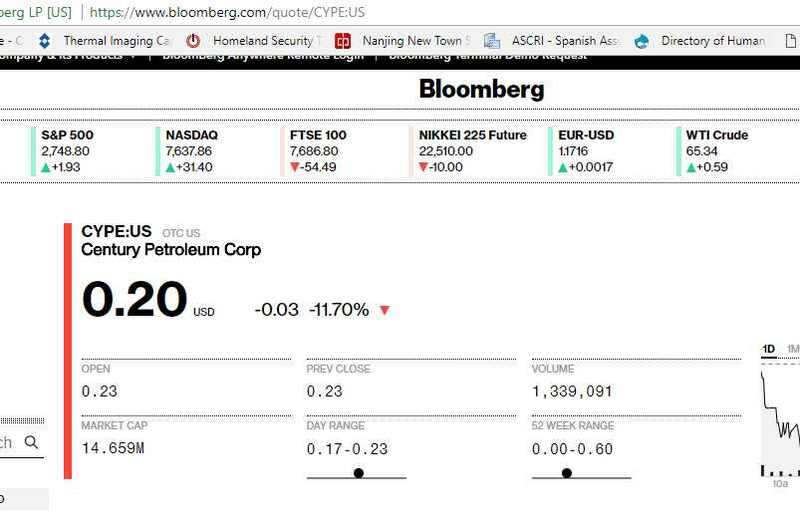 Using Bloomberg, Century Petroleum trades at 20 cents per share, giving the company a total market cap of about $15 million. If we assume Mr Ibeto paid a premium, you would be looking at him spending about $15 million for the 70% control he now enjoys. In other words, I am assuming the owners sold for say $20 million with $6 million the estimated premium. Typically, that should have reflected on the share price, but this is OTC, not the main board, and time does lag [if you check the Bloomberg link, on announcement day, around last week of May, price went up to 35 cents as some people took profits and exited. But it has normalized. The good news is that price remains above deal-day price, signifying positive outlook). With this deal, Ibeto Cement has met one of the condition-precedents to raise $850 million from Milost Global, a New York private equity firm, as reported by Bloomberg. Ibeto Cement Co. Ltd., a privately owned Nigerian producer of the building material, signed a deal to get $850 million in financing from Milost Global Inc, according to the New York- based private equity firm. Milost will provide $500 million in equity and $350 million as debt to the Nigerian cement maker, Milost said in a statement on its website, citing a “binding” agreement by the two parties. Milost in March ended talks to provide $1 billion to Nigeria’s Unity Bank Plc alleging threats by some suspected shareholders. The lender denied entering a binding agreement with the private equity firm, saying talks were only preliminary. Now, Dangote Cement may need to cut cement prices as Ibeto Cement could be offering options in Nigeria. If this works out well, I expect Japaul Oil to exit NSE and relist in U.S. This could become a trend.